Students from Manila already revealed their disappointment to Philippine President Rodrigo Duterte on Tuesday by carrying placards and shouting their personal expressions in public. 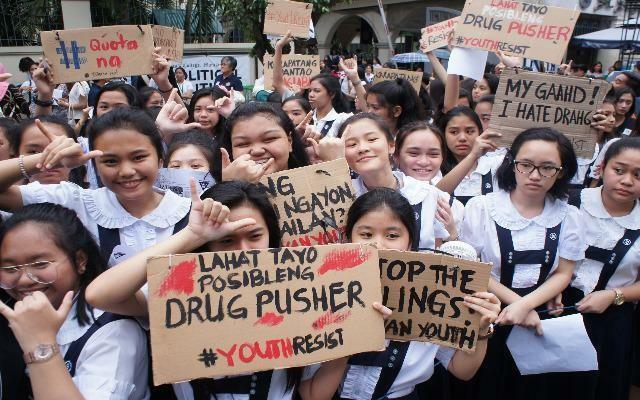 With the different placards and voices from the high school students in Manila, they gathered in public on Tuesday to express their disappointment about the Duterte administration, as reported by the Inquirer.net online. The rally of the students came before the upcoming State of the Nation Address. The students are from the St. Scholastica College and went out the street to express their personal anger with Duterte and his administration. According from one of the speakers Shibby de Guzman, why do the Filipino people allowing them to abuse their power. The entire issue of the rally include about extrajudicial kllings (EJKs) caused by the active campaign of the government against drug users and dealers. As for Sister Mary John Mananzan, this kind of activity of the high school students is part of their education to keep their awareness of the issues about socio-political in the country. “It’s the weak against the strong,” said Mananzan. “Today we are asking these questions with the loudest voices, the loudest protest,” said de Guzman. “A lot of people have asked how many people will be here today. The answer is we are more than enough to stand against the misogynistic, power-abusive administration,” she added as quoted by the Inquirer news. Based on the shared information about the rally, there are about 200 participating students (Grades 9 to 11) of which they gathered in front of the St. Scholastica College on Leon Guinto Street, Manila.